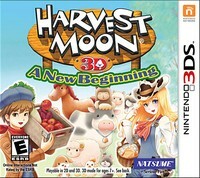 Harvest Moon 3D A New Beginning is a bit of a disappointment for me. It is one of the slowest Harvest Moon games I have ever played. It takes almost the full first season for things to start to progress. At that point only the truest most die hard fans will still be playing. It is obvious the ESRB did not make it this far otherwise Suggestive Themes would have been on the descriptors. And it should be one of the descriptors too. The big deal in Harvest Moon 3D A New Beginning is building our own buildings. We purchase blueprints and then we can amass the resources to make the buildings. Some resources can be purchased from the same shop that sells the blueprints. Many of the graphics in Harvest Moon 3D A New Beginning have been super-sized. Those vegetables have been made huge. The 3D is okay, and not one of the reasons I play this semi farming simulator. The harvest goddess makes her return unfortunately. So does that lame witch princess. Why? If Harvest Moon 3D A New Beginning is supposed to be a new beginning why not drop them? It was the perfect opportunity. One that Natsume squandered. From the waist up all the harvest goddess is wearing is essentially a bikini top. I go back to why? It can take six to eight hours to get the ball rolling in Harvest Moon 3D A New Beginning. Once you do you realize the long climb up just to do much of anything. We also have to do the same things day after day in this 3DS game. The slowness of Harvest Moon 3D A New Beginning amplified the repetitive nature. Ultimately it hurts it - bad. Harvest Moon 3D A New Beginning feels extremely stagnant. Aside from the blueprints there is little new in this game. We plant, take care of animals, forage for items on the same screens over and over again. We have to deal with sprites, and other religious characters. The town in Harvest Moon 3D A New Beginning starts extremely tiny and eventually grows. Players can amass huge amounts of wealth in this hand held game since we can sell almost everything.